It’s important that you know how to use the STAR method to answer behavioral questions because interviewers are always asking them, so you need to be prepared for them. For each question I’m going to describe the Situation, part 1. The first thing you want to do when answering a behavioral question is describe a work related Situation or Task that you needed to accomplish. And be concise. Then describe the Action you took. Don’t tell them what you might do or would do, but instead, tell them what you did. And finally, describe what happened — the result. What did you accomplish? What did you learn? How much time or money did you save? And most importantly, does your result solve the problem you described in step 1? That’s the formula for answering any behavioral question. As you’ll notice in the coming pages, all of my answers are short and sweet. I don’t use long paragraphs to explain how I did things. Instead, I use short statements that get to the point. If your interviewer wants to know more about your experiences, then you can elaborate, but no need to overwhelm them with details if they aren’t looking for them. Make sense? For obvious reasons, you won’t be able to use the same exact stories from my examples – you’ll need your own stories. But you can use the same framework for how I set up the Situation, how I attempted to solve the problem, and how I wrap it up with a conclusion. Once you see how I explain things, you’ll be able to apply the STAR method to any type of interview question. 1.) Tell us about a time when you had to go above and beyond the call of duty in order to get a job done. I was working as a social worker at Touch of life, a support center for disabled children. Most of the children were either blind or deaf and communication was a huge barrier in my work performance and meeting their needs was difficult. I requested the organization to employ a sign language interpreter to help me with the children, but they could not afford extra manpower. So I enrolled for sign language classes with my own resources to enable me to communicate better with the children. After three months into the course, I was able to communicate with 90% of the children, and better serve their needs. With better communication we were able to give donors specific requests and donor funds increased by 20%. Later when the organization got funds they refunded me the entire tuition cost I had spent to educate myself on sign language. 2.) What is the most competitive work situation you have experienced? How did you handle it? What was the result? While working as a sales representative for a car dealership there was a rule that whoever sold the most cars that year would have 50% of their mortgage paid off and have the latest car model given to them. Most of my colleagues became so obsessed with winning the competition that they started sabotaging each other’s efforts to make sales. I remained friendly to my colleges not letting the huge reward get to my character. I encouraged my workmates that it was better if we worked together than against each other. We called for a meeting with the head of sales and we told him what the competition was doing to us. The huge reward was removed and in place groups were formed and a new reward was set up. Working in groups created a more hospitable work environment and enhanced team work and made the goal more attainable. 3.) When you have a lot of work to do, how do you get it all done? Give me an example? When I was working as the head manager for a bank in Chicago, I used to have a hard time finishing my work on time. I hardly had extra time to bond and supervise my juniors or even take proper lunch breaks. I realized most of the work and decision making was left to me, while my assistant didn’t have much on his plate. I decided to divide my work into different categories, urgent, moderate, and least urgent. I also divided the tasks into those which needed my individual attention and general tasks. I delegated all the least demanding and least sensitive tasks to my subordinate staff. I learned that delegation helped me reduce my workload by 70%. This gave me enough time to finish all my other pending tasks so I could get all my work done on time. It also made me appreciate the efforts of my staff even more than I did before. 4.) Give a specific example of a time when you had to address an angry customer. What was the problem and what was the outcome? When I worked at a clothing store we had a policy that if a customer wanted to return something they had purchased online they had to present the printed invoice as well. One time a customer had forgotten her invoice and was frustrated by our policy. She lived far away and rarely came into the store. The computer cannot perform an online return without the invoice but I felt bad for the customer. From experience I knew that she would feel better being helped by a manager so I asked my manager to help the customer. They discussed her situation and my manager decided to return the items by overriding the system, and gave the customer store credit. She was able to pick out items to replace her return and left a satisfied customer. When I realized I didn’t have the ability to change the situation and diffuse the customer’s frustration, I knew my manager would be able to and she successfully helped make that customer’s experience with us a positive one. 5.) It is very important to build good relationships at work but sometimes it doesn’t always work. Can you tell me about a time when you were not able to build a successful relationship with a difficult person? I was assigned to work on a project with someone outside of my department who I had never met. Initially we were able to work alongside each other just fine but as we spent more time together he consistently missed work, would not complete his portion of the project, and got frustrated with me for not picking up the slack. At first I was furious. I was new to my position and wanted to make a good impression but he made it very difficult to be a positive force in the workplace. I worked with my boss to facilitate inter-department communication, which resulted in less face time with my coworker to complete the project. The time we worked together was reduced to a meeting once a week to follow-up with each other on how our portion of the project was progressing. Anything that was not completed was up to that worker’s department to finish. We ended up finishing a few weeks later than expected. I’m sure we would have finished the project sooner if we had kept up working together but I’m also sure I would have done most of the work. But the extra three weeks it took to complete was not an issue for the company. 6.) Have you ever worked in a situation where the rules and guidelines were not clear? Tell me about it. I work best with clear instruction and expectations so when I stepped into a new role which had neither, it was very stressful. The company had just created the position to augment the workload for a similar position but had not taken the time to sit down to get into the details of what my tasks would be. I felt anxious and frustrated because I wanted to perform well as a newcomer but was unsure what my measurable goals were. I asked my boss for some direction, which she gave me, but I soon realized she was too busy with her own work to spontaneously talk about my performance. I scheduled a meeting with her and until that point I set about creating my own goals. I had obviously gotten the job and knew the basic requirements so I knew I was qualified to produce the work they were looking for. I set long-term goals to be accomplished in six months and worked backwards from there. Through this process I was able to come up with daily measurable goals to guide my work and felt reassured that I would be successful in my new role. When I had the meeting with my boss I reviewed my goals with her and she was very impressed with my ability to work independently. 7.) Describe the most significant presentation you had to give? In my last semester of college I had to present my final project which counted for 50% of my grade. If I did poorly on the presentation I would have to retake the class, thereby putting off my graduation another semester. I felt the pressure of the situation and prepared for weeks to make sure I performed well. Students were required to have a visual aid to accompany their presentation, so I took that opportunity to go above and beyond. I worked with a designer friend to come up with an amazing poster and had it professionally printed. I brought candy to toss into the audience as people participated in my presentation and had personalized business cards made up so I could show how seriously I understood the importance of networking. My hard work paid off. The presentation went very well and I passed the class, graduating on time. My teacher was very impressed with my effort and asked to keep my poster to use as an example for future classes. 8.) How do you go about explaining a complex technical problem to a person who does not understand technical jargon? The hospital I used to work for used a Pyxis machine to dispense medications for the patients. As a doctor, it was my job to pass meds on the floor. When new staff came on, I had to train them to use this system. By medical standards, the Pyxis is a bit antiquated and could be difficult to use if you’re not familiar with it and not used to the terms used to keep it functioning properly. After dozens of attempts to train the new staff to use it, I made a decision to create a roadmap to help the staff understand how it operated and how it connected to the in-house hospital pharmacy and what steps to take to ensure all of the functions worked properly. We eliminated the technical jargon and used a numbered system so all the staff would have to do is count from one to eight to ensure they’d completed everything with their medication passes. The elimination of the technical jargon made things easier for everyone. It gave the staff a check and balance system that helped to ensure the right medications were being dispensed to the right patient and that all the steps were completely error-free. 9.) Describe a recent unpopular decision you made and what the result was. There was this guy Tim who worked for me and was stationed in a big office with his co-workers and he was speaking to a client on the phone. While he was on the phone his co-workers were very loud and made it difficult for him to hear the client. Even after flashing a hand gesture to his co-workers they still wouldn’t lower their voice. Tim came to me to complain about the incident. Later I held a meeting and addressed the issue and instituted a new policy that everyone needed to be quiet all the time in the sales area, even if no one was on the phone. Even though everyone knew it was Tim who had reported the matter, I took the heat because of the new policy. But everyone eventually realized they had to respect their working hours and co-workers. They also realized that they were there to take care of clients and not goof around. 10.) Sometimes we need to remain calm on the outside when we are really upset on the inside. Give an example of a time that this happened to you. I worked as a server in a busy restaurant. One day, I was very busy with a large amount of tables. I had a customer whose order came out wrong and she got very upset and proceeded to berate me in the middle of the dining room and walk out on her bill. I was extremely upset, but knew that I had many other customers who needed my attention. I took a minute in the kitchen, away from the sight lines of the customers to collect myself, and then resumed working. I reminded myself that one unpleasant experience shouldn’t affect and ruin the remainder of my shift, as it would detract from the customer experience for everyone else. The rest of my shift passed without incident. The manager adjusted my sales to compensate the patron who walked out, as it was a kitchen error. My other tables were very grateful for my service and many of them commented on my professional handling of the situation. – Can you work under pressure? – Could you describe a difficult problem and how you dealt with it? – What were some of the things you did not like about your last job? – How do you accept criticism? – What is the most difficult situation you have faced? – How do you manage your time? – How do you get things done? – What are some of the things that bother you? – Do you prefer working with others or alone? – How do you get along with different types of people? – Can you give me an example of a project that didn’t work out well? – What are some of the things you and your supervisor have disagreed on? There are over 130+ questions and answers in the Complete Interview Answer Guide. It even has STAR Behavioral Questions. 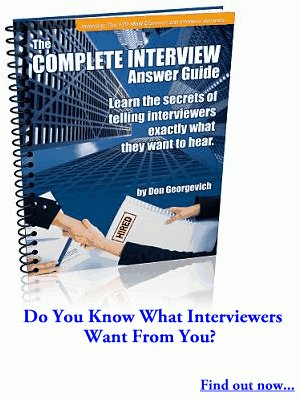 It has more questions than any other job interview guide that is available in eBook, Audio/Video and Hard Copy.